Story: Two women caught up in a drama of need and betrayal are at the heart of this psychological thriller. 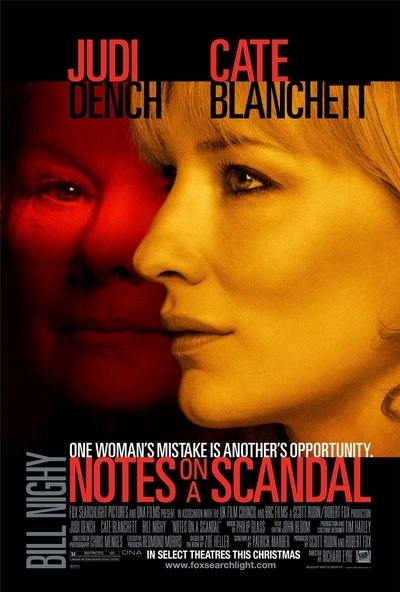 The twists and turns of the story are noted in the acerbic diary of Barbara Covett (Dame Judi Dench), a domineering and solitary teacher who rules with an iron fist over her classroom at a decaying state-run secondary school in London. Save for her cat, Portia, Barbara lives alone, without friends or confidantes - but her world changes when she meets the school's new art teacher, Sheba Hart (Cate Blanchett). Sheba appears to be the kindred spirit and loyal friend Barbara has always been seeking. But when she discovers that Sheba is having an incendiary affair with one of her young students (Andrew Simpson), their budding relationship takes an ominous turn. Now, as Barbara threatens to expose Sheba's terrible secret to both her husband (Bill Nighy) and the world, Barbara's own secrets and dark obsessions come tumbling to the fore, exposing the deceptions at the core of each of the women's lives.